August 1998-Present: The University at Texas at Austin, Austin, TX. 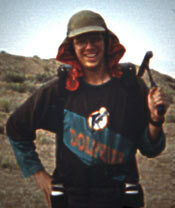 Enrolled in the Ph.D. program for Vertebrate Paleontology, Department of Geological Sciences. August 1994-May 1998: Louisiana State University, Baton Rouge, LA. B.S. in Geology. Some relevant courses taken: Evolutionary Biology; Zoology; Vertebrate and Invertebrate Paleontology; Dinosaurs, Theories, and Extinctions; Comparative Anatomy of the Vertebrates. - Mapping of Fort Polk vertebrate fossil sites. - Collection of fossils at Fort Polk sites. - Preparation of Fort Polk Miocene rocks for picking in acid bath lab. - Picking of Fort Polk fossils obtained from retrieval process. - Preparation, picking, sorting, and cataloging of foraminifers (dry and wet). - Teaching Assistant for Age of Dinosaurs class. - Teaching Assistant for Introduction to Geology class. - Collection of vertebrate fossils from the Kayenta Fm. (Lower Jurassic) of NE Arizona. - Data processing in High Resolution X-ray CT facility.